You’re invited to join us at Panera in Chelmsford on Thursday, where they will be donating 20% of the tab to TEMV if you show them the special flyer below. Please also come to Shabbat Services and a baby naming on Friday! 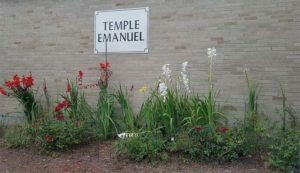 6:00 p.m. Family Shabbat Services, including blessings and baby naming for the Papps’ grandchild. 6:45 p.m. Community dinner. The Papps are hosting this as an Italian-themed potluck, and will be providing a few dishes, but we invite you to bring something as well (Italian or otherwise). Please RSVP to pizza@temv.org and let us know how many are coming with you and what category of food you will bring: salad, appetizer, vegetable, main dish, dessert, or other. Rabbi Sparr is available for office hours Thursday this week; appointments must be made in advance by contacting her by e-mail, or during business hours at 508-736-5555. In an emergency or urgent need, do phone at any hour. No school through the summer. Registrations for next year are now being accepted. Kindly submit your forms and deposit at your earliest opportunity. Panera FUNdraiser: Sandwiches, Salads and Soups…Oh My! June 7, 4 to 8 p.m.
We are now in a new Fiscal Year! It is crucial to the financial well-being and sustainability of our community that each of us commits to a designated amount the TEMV community can rely on, this year more than ever. Please consider what the right amount of financial support is for you and your family, and indicate it on the Pledge Form. Your contribution is kept confidential. Please return the form by June 1 so we can better plan the year and anticipate our revenue. Don’t hesitate to reach out to me with questions or concerns. Next year’s adult education offerings will be determined soon. If you have an area of particular interest, please let Rabbi Sparr know so that it may be considered.